1930-32: Student at the Beaux-Arts (High School of Arts) in Paris, in the architecture section. 1932-36: Back to Poland. Student at the Academy of Fine Arts in Krakow, with professors T. Axientowicz, W. Jarocki and F. Pautsch. In Krakow, he founded the art group “Alive People” with some friends. He then joined H. Wicinski, M. Jarema, J. Stern and L. Levicki in an avant-garde group of artists called “The Krakow Group”. Their first exhibition took place in Lvov in 1933. He joined the union of Polish artists and writers (“ZZPAP”) before being expelled in 1937 on the grounds of political activism. In 1935 he worked in Bielsk’s Jewish theatre for children where he did stage work and props. 1937: Personal exhibition at Warsaw’s Koterby Gallery. Went back to Paris. 1937-39: Settled into his workshop at No. 5 Cité Falguière, in Paris. Took part in the International Exhibition in 1937. Met painters from the School of Paris such as Chaïm Soutine, Pinchus Kremegne, Isaac Dobrinski and Ludwig Klimek. 1939: He was drafted into the Polish army in France. July 1940: Dismissed in Toulouse. 1940-42: Found refuge near Aix-en-Provence and then Carcassonne in the homes of Hallwachs and Rives, who were themselves with the Resistance. 1943: Married Louise Bonfils, a young physics and chemistry professor who was teaching in Carcassonne. 1943-48: He set up home in Carcassone in the South of France and went through an intense period of creativity, when he met a lot of artists and intellectuals. He made several trips to Perpignan and Collioure where he met André Libion, Balbino Giner and other Catalan painters. During his stay, he saw Raoul Duffy who purchased three of his paintings. In Sète, where he went to regulary, he met other future members of the Montpellier – Sete School around Desnoyer, including Couderc, Descossy, Barthélemy, Espinasse and Raissac. In groups of two or three, they used to walk up St Clair hill to paint the same landscape. He had two children: Hélène (born in 1944) and Marc (born in 1945). He was a Member of the Society of Independent Painters and a resident painter at the Salon d’Automne. 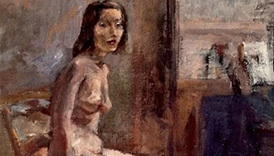 Exhibited alone or with a group of painters in Toulouse, Perpignan, Béziers, Sète, Montpellier and Carcassonne. The Vernière-Decabezon gallery based in Montpellier purchased several of his paintings. Summer 1948: Moved to Sceaux and then Paris with his family. He died accidentally on June 14th 1949 in Paris. He left more than 700 oil paintings behind and as many drawings. 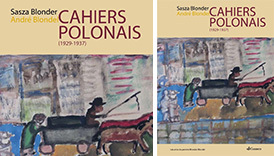 Book "CAHIERS Polish (1929-1937) Sasza André Blondel Blonder"
Polish notebook, 2013, Gaussen editions.